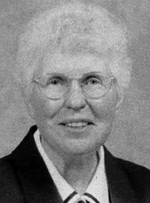 Sister Loretta Marchetti, S.S.J., formerly Sister Ann Jerome, died Dec. 31, 2015 at St. Joseph Villa, Flourtown. She was in the 53rd year of her religious life and was 73 years old. Born in Ashland, Pa., Sister Loretta was the daughter of Jerome Marchetti and Ann O’Gara Marchetti. She attended St. Mary Elementary School and Franklin Roosevelt High School in Kulpmont, Pa. She earned a B.S. degree from Chestnut Hill College and a M.A. from La Salle University. Sister Loretta entered the Congregation of the Sisters of St. Joseph on Sept. 12, 1962 and professed final vows on Aug. 16, 1970. As a teacher, she taught in the Archdiocese of Philadelphia, and also in the Dioceses of Allentown, Harrisburg, Metuchen, and Trenton. She ministered as director of religious education in the Dioceses of Harrisburg and Baltimore. In July 2006, she was parish minister at Sacred Heart Glyndon, Maryland. Sister Loretta became a resident of Saint Joseph Villa in 2007 where she remained a resident until the time of her death. The funeral Mass was celebrated Jan. 4, 2016 at St. Joseph Villa. She is survived by her brothers and sisters, Bernard, John, Carol, and Robert Marchetti, Deanna Emil, Cathy Hubert, Lisa Howerter, Joan Cole, Christine Emerik, many nieces and nephews, and her SSJ Congregation.